There’s very few times in life when you are able to understand and actually be a part of a musical revolution as it is happening. Sgt. Pepper’s, Kind Of Blue, Are You Experienced and The Times They Are A-Changin’ were all released way before I was born. I missed London Calling by four months. I was too young to really know the impact of Thriller and The Joshua Tree when they came out. Probably the closest I ever got growing up was when Nevermind was released, but I think I just really enjoyed it more than I knew how much of a game changer it was. However, when Wilco put out Yankee Hotel Foxtrot in 2001, I knew I was finally privy to a musical coup in progress. Wilco had drawn a line in the sand and invited everyone to approach music, song structure and the entire listening experience differently. I gladly accepted the invitation. For an in-depth look behind the making of Yankee Hotel Foxtrot, you can pick up their excellent DVD, I Am Trying To Break Your Heart, but here’s the cliff notes. By 2001, Wilco had released 3 full albums and 2 collaboration albums with Billy Bragg. They were the sweethearts of the alt-country rodeo and they deserved it. Jeff Tweedy’s songwriting was (and still is) a perfect blend of optimism and heartbreak and although the band behind him had a bit of a revolving door thing going on, each member did their part to create an interesting, cohesive sound that was unique to Wilco. While recording Yankee Hotel Foxtrot, Wilco’s label, Reprise Records, experienced some shake-ups that caused the president of Reprise, an ardent Wilco supporter, to be fired. 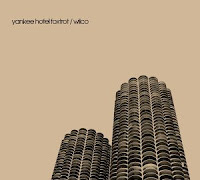 The new president didn’t think Wilco was marketable enough and refused to release Yankee Hotel Foxtrot. Reprise ended up dropping Wilco but surprisingly gave them the masters and the rights to the album. Without a record company, Wilco ended up streaming the album for free on their website. Within a month or so, Wilco was signed to Nonesuch Records, which was pretty cool in itself because Nonesuch and Reprise were both under the same AOL Time Warner umbrella. So in reality, AOL Time Warner paid for Wilco to record Yankee Hotel Foxtrot, gave them the rights for free and then bought it back from them. The importance of Yankee Hotel Foxtrot shouldn’t be overlooked, but even a casual listen will allow you to understand that there wasn’t anything like it before. Jeff Tweedy’s desire to write intelligent, clever folk songs that could be deconstructed by the band, while also blurring the lines that divide structure from cacophony is fully realized on each and every song off the album. Layers and layers of music and noise blanket each track without ever detracting from the fact that there is an actual song underneath. You could strip everything away, which Jeff Tweedy has done for many solo shows, and play each of the songs on just an acoustic guitar without losing anything. I think that is the key to what makes Yankee Hotel Foxtrot so special and so significant. For all the unconventional sounds and musical freak outs on the album, there are really, really good songs that are holding everything together. The songwriting is so imaginative and the musical foundation remains somehow familiar enough that all of the random things happening on top of the songs can be enjoyed and you can even discover new sounds every time you listen to it. Very rarely does a band create both the depth and the space that Wilco does on this album. As far as lyrics, I bow my pen and notebook at the throne of Tweedy. Anyone who can write lines like “I would like to salute the ashes of American flags and all the fallen leaves filling up shopping bags” and “I myself have found a real rival in myself, I am hoping for the rearrival of my health” and “I am an American aquarium drinker, I assassin down the avenue” is intent on combining heart and mind, emotion and imagination into the words. Emogination, that’s what I’ll call it. Jeff Tweedy wields emogination like no other. I mean, who uses assassin as a verb? Brilliant! Sure, I don’t know exactly what he means by it, but I can feel what he’s trying to convey because of his incomparable word choices. He will eventually be spoken of in songwriting conversations the same way Bob Dylan and John Lennon are now. Yankee Hotel Foxtrot is one of those albums that everyone should listen to at least once. If you haven’t already, you owe it to yourself to sit down with the album and let every word, strum, and clang get into you. If you don’t like it on the first listen, it’s okay. A few days later you’ll find yourself humming a song you can’t place or dropping the phrase “you are not my typewriter” into everyday conversations and you will wonder where they came from. You will lie awake at night, wondering why, until you give the album another spin and just like scratching a nagging itch, you’ll feel that joyous release. Most likely though, you’ll dig it the first time around and become a long-term Wilco fan.